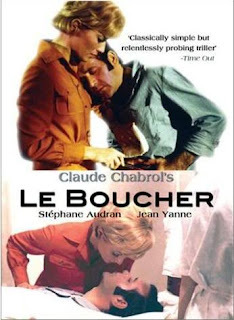 Movie Ramble: Le Boucher (The Butcher) 1969. Le Boucher (The Butcher) 1969. Claude Chabrol commitment to film making was for simple plots with complicated characters. Le Boucher (1969) is a fine example of this. It basically involves two main characters, the beautiful but frigid Helene with a failed relationship which has soured the chance of any further romantic relationships, her emotions are now dedicated to the pupils of the small village school where she teaches and Popaul the local village butcher a desperately unhappy man with a deprived family background followed by 15 brutalising years in the army. The depth of these two emotionally damaged characters are skilfully portrayed by the very attractive Stephane Audran as Helene Marcoux and Jean Yanne as Popaul Thomas. Set in the Perigord village of Le Tremolet with its small family-run shops and where everybody knows everyone else there’s a serial killer on the loose. Chabrol’s superbly filmed story builds tension form nowhere and demonstrates how ‘bad’ can be attracted by good and ‘good’ can be attracted by bad. If affection is freely given then anyone can be redeemed is the theory behind this very enjoyable slow burner.